I've had the unique opportunity to be intertwined in many aspects of the marine industry in Canada. Whether is in my professional life working on ship across the nation, or through my hobby Marine Engineering website, www.dieselduck.net, I get to see many different perspectives. One of which, I would like to share with you, regarding the formal training of Marine Engineers in Western Canada, in the context of the global shortage of such professionals. 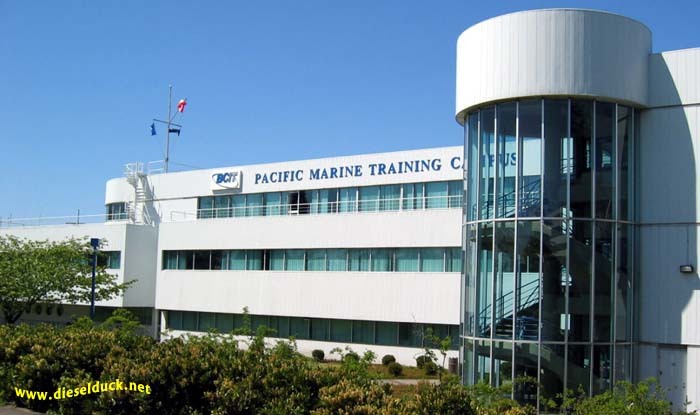 In the early 1990's Pacific Marine Training Campus in North Vancouver, on Canada's west coast - PMTC - ceased to offer the Marine Engineering Diploma program. I am not sure how many candidates remain in the Marine Industry from that program, but I understand it was very few. It wasn't until 1996 that the school started training Marine Engineers again, this time under the provincially controlled Apprenticeship Program. I was fortunate enough to be in this program. On day one of the theoretical portion of our apprenticeship program, in Sept 1996, it was reported that 16 apprentices were signed up. Unfortunately, we heard that BC Ferries pulled its funding for the program, and right away we were down to 8 in the program. Three more dropped out pretty quick, but we picked up another apprentice in the second year later. For the three years of the theoretical training modules, we had 6 apprentices in the class. Three were sponsored by the BC Ministry of Highways, the inland ferries; one with Seaspan, one with Rivtow, and another being somewhat sponsored by BC Ferries. I believe the BC Ferries apprentice did not complete the program, although she may still be in the industry. One apprentice from the inland fleet is probably retired now, the other left the industry altogether, as did the apprentice from Rivtow. Out of that apprenticeship class, only the apprentice from Seaspan and myself, continue to work at sea; although both of us have not reached the First Class certificate. The Apprenticeship Program did not provide the Transport Canada exam exemptions that the new Cadet program enjoys, making progression through the ranks, additionally challenging. In 1997, we heard that the provincial government had disbanded many apprenticeship programs, including the Marine Engineering one. At the same time, BCIT which had recently taken over PMTC in North Vancouver, and renamed it PMC - Pacific Marine Campus - began working on a new cadet training scheme, based on the International Shipping Federation's cadet program. In BC, the program would be very similar to the apprenticeship program, however, relieved the local marine employers of much of the "burden" of the training's cooperative process. The training would be paid primarily by the province's education budget, through BCIT, with students paying their own tuition, much like any other post-secondary education student in the province. The shipboard phases, a crucial component of the training package, would be the responsibility of the student, coordinated through BCIT's cadet coordinator, under post-secondary education's model of a "co-op". 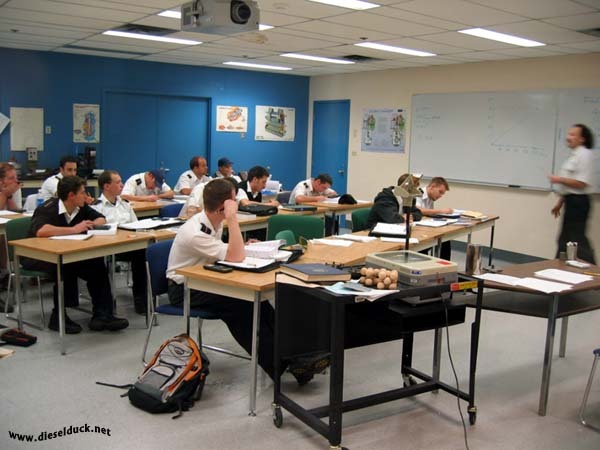 In 1998 BCIT introduces the new Marine Engineering (and Nautical, or, Deck) Cadet Programs. A four year program, with a substantive "hands on" component - one full year of training in the mechanic shop, and three sea phases - combined with a major dose of theoretical learning, capped off with all the mandated safety training. A "neat and tidy" package, encompassing all the required training, built into one program. In comparison, the Apprenticeship or Diploma program only included the theoretical component as the program's responsibility. The pre-apprenticeship mechanic training, the mandate safety training, the hands on training at sea, and the additional short courses, such as simulator training, were not part of PMTC program. Overall, the new cadet program is very well presented as a single training package, and the responsibilities are much clearer for the student, who really deals with BCIT alone - there is no training supervisor at the government level, or at the company level; Transport Canada only comes in supportive and oversight capacity. The first intake was in September 1998, with 16 engineering cadets signed up. Of those, 4 finished all the required phases and reached convocation; another four cadet would complete the requirements, but at a later time. Of that first Engineering Cadet class, I understand there is only one person currently sailing, that has achieved First Class Certificate - having completed the process a couple months ago. However, a second person is one exam away from reaching a First Class certificate. Both are still sailing, but one is looking at coming ashore shortly. Three other classmates are still sailing on commercial ship, in junior engineer roles, in Canada and deep sea. The second Engineering Cadet intake at BCIT, in North Vancouver, occurred in September 1999. This time 12 Cadets appeared on the first day. Like all Marine Engineering program, that number dwindles down, and only seven completed the program. Of those seven, only one has recently achieved a First Class Certificate, but he is moving ashore, in a related industry position. Three others are reported working ashore; the remaining three are working on commercial ships, two in Canada, the other, overseas. In the subsequent classes, I believe there is only one more Engineering Cadet that has reached first class certification, however he is working ashore. When I was working on a large passenger ship, I actually quite liked the 14 weeks on 14 weeks off rotation. It gave enough time at home, and on the ship, to reap the benefits of one�s own work. In the three months onboard, I was able implement changes to operations and techniques, and had enough time to observe the results of those changes, and how it impacted the operation. Similarly now, I am starting to observed the results of the changes in Marine Engineering training attitudes, and policies, taken so many years ago. BCIT is refining its program all the time; I understand this year's Engineering Cadet graduating class will be the first to see all those that started the program, complete it. This is an outstanding achievement. I theorize we will also be able to expect improvement on the figures of attaining senior certificate levels, as well. BCIT is the only institution in Western Canada that produces formally trained Marine Engineers, and is one of the leading institutions of its kind in Canada. With this in mind, one can quickly appreciate the precipitous situation that ship operators, and the industry as whole, are facing. There is two points to this article. Firstly; since the early 1990's until Sept 2012, roughly 20 years, our training institutions in Western Canada, and industry partners - and I use the term loosely - has produced three Transport Canada certificated First Class Marine Engineer. Two are working ashore, in a related marine capacity in Canada, while the third is actively sailing, although he does not work in the Canadian market. He is working for the same UK company, which paid him, and his training, for a whole year, to upgrade his Second Class Certificate to a First Class Certificate. He has, of course, been given a new position with the same company, as Chief Engineer, aboard a new offshore oil services vessel, just being completed in China. The second point I'd like to make: I think it's safe to say that it takes ten years, after the successful completion of a Marine Engineering Cadet program, before a small percentage of those graduate achieve a First Class Certificate from Transport Canada. If a certificated seafarer is a "product" that your operation needs, you will need a 14 year lead time to order one. Never mind the complications of actually getting young people interested in ship life, and its numerous challenges. In Western Canada, all levels of certificated Marine Engineers are required on a wide variety of vessels. 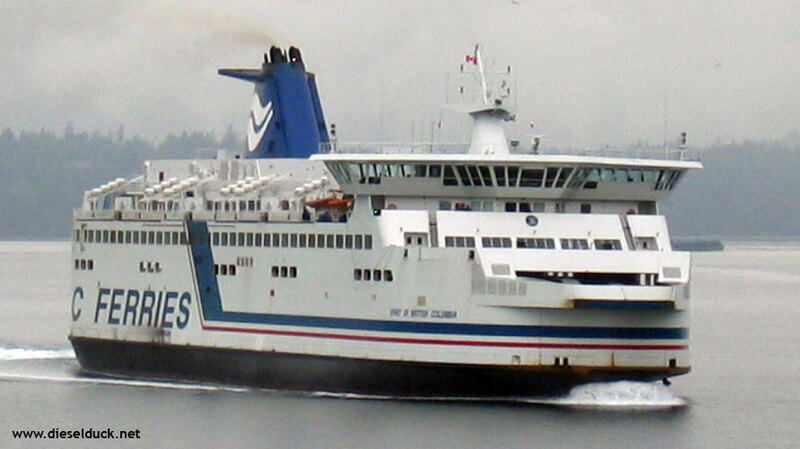 BC Ferries and the Canadian Merchant Service Guild (the union representing a large number of Marine Officers for Seaspan, SMIT, Fraser River Pile and Dredge, Coast Guard, NTCL, and numerous other operators), are the primary employers of Marine Engineers. Additionally, there is a need for engineers for independent vessel operators such as tugs and fishing vessels. With even small tugs and fishing vessels having 4000-6000 hp installed, it is easy to determine that there is a significant need for certificate engineering officers who are willing to sail. A need, I propose to you, that the current situation in training and industry is not able to support. With this in mind, I would suggest ship operators have an immediate threat to their ability to operate their fleets. They are lacking certificated people in required roles onboard, no matter what level of experience they may have. The long term threat, however, is the lack of experienced people ashore. With the way professional seafarers are currently treated by shore side, I suspect the shortage of experience ashore, is really the biggest of the threats to ship operators. As a friend of mine often says, "it is what is it is". It's plain to see from my perspective that there needs to be some radical new ideas from owners, unions and governments - at home and abroad. The status quo is clearly not a sustainable model, fortunately or not, the situation in Western Canada is not an isolated case; I am observing it in numerous jurisdictions. Puzzling to me, is the appearance of a "laissez-faire" attitude by industry, especially in Canada, which leads me to ask, what is the end game? MW in early 2013, writes the following comments, regarding the apprenticeship program.
" I just read your article "Reap what you sow" and I thought I would correct you on a couple of points. I graduated from the Marine Engineering Apprenticeship Program in 1990 and I know people who were in the apprenticeship program before me and after me. I think your start date for the apprenticeship program should be 1980. I hold a combined 1st Class Marine Engineer Certificate - Motor and Steam, which I wrote on the west coast of Canada. I work on modern LNG Tankers for Shell Oil. The ships I work on are of two designs. One type has a modern steam turbine propulsion plant that burns the boil off natural gas from the cargo tanks. The second type has a modern camless (electronic fuel injected) low speed diesel MAN B&W propulsion plant and a nitrogen based reliquefaction plant for the boil off cargo. A very good friend of mine who also came through the apprenticeship program (we were at the diesel mechanics program at VCC together in 1986) holds a 1st Class Marine Engineer Motor Certificate. He is Chief Engineer on Anchor Handlers for Gulf Offshore based out of the U.K. I also know of two other people from my graduating class that hold 1st Class Marine Engineering Certificates. I think if you dig a little deeper into your investigation work you'll find there have been quite a few graduates from PMTI/PMC that achieved a 1st Class Marine Engineer Certificate and are working at sea today as Chief Engineer." Point taken MW. The Apprenticeship program start date goes back further than stated in the article above. I tried contacting BCIT before publishing the article, to clarify some facts, but was unable to get a response. Additionally, the provincial body responsible for the Apprenticeship program was dissolved and reborn as a different entity, and the information on past Marine Engineering Apprenticeship performance is not available. In the article, I chose a timeline, 1992-2012, where I could speak with some authority, due to my first hand experience. However it does not discount previous success of various programs. The point of the article remains valid; there is a long stretch of time where no engineers where formally produced in BC. Furthermore, the first class certificates produced by the apprenticeship program prior to 1992, according to the input above, at least 50% do not work in the Canadian market.